Home | The big apple continues to fascinate with every bite! The big apple continues to fascinate with every bite! As one of the major financial centers in the world, New York features an incredible diversity of cultures, social classes that occupy elegant neighbourhoods, as well as less privileged ones with contrasting food realities that feed, yet never satiate, the curiosity of our Food Innovation researchers. Such contrast has proven to be a fertile ground for innovation that shifts social dynamics, such as the case of the Green Bronx Machine. Opened in 1807 in Lower Manhattan and moved in 1822 at the current location (400,000 square foot facility with 37 seafood wholesale businesses). Went early morning for a tour and interviewed people. The Fulton Stall Market is a marketplace for local foods connecting farmers and producers with the Lower Manhattan community. Located in the historic district where the City’s markets began in the 1700’s, it’s a first step toward development of a year-round indoor public market for NYC featuring local products and educational programming celebrating the Seaport District’s vibrant market history. Upcycling brewer’s spent grain into sustainable and highly nutritious flour. It has a high content of fiber and protein and is low in carbohydrates. Every batch of flour is sourced from craft breweries in New York City and embodies the unique flavors and aromas from local ales, lagers and stouts. 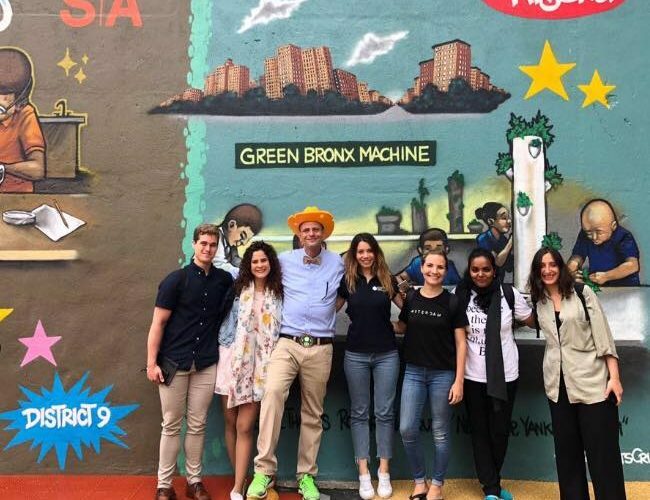 Green Bronx Machine builds healthy, equitable, and resilient communities through inspired education, local food systems, and 21st Century workforce development. We visited the school where Stephen Ritz started it all, Community School 55. Dedicated to cultivating minds and harvesting hope, the school-based model using urban agriculture aligned to key school performance indicators grows healthy students and healthy schools to transform communities that are fragmented and marginalized into neighborhoods that are inclusive and thriving. Visited the facility that delivers packages of how quality ingredients together with recipes designed by chefs with step by step instructions for the less experienced cooks. Met the founder and interviewed him about his vision for the future of proteins, and the world’s first plant based alternative to Tuna. Empowering refugees through culinary lessons. Burlap & Barrel is rethinking international spice supply chains to make them direct, transparent and traceable. They connect­ smallholder spice farmers to high-value markets, educate consumers about the impact of product traceability on human rights, and emphasize unique products with terroir that are grown biodynamically using traditional techniques. They work to end inequality and exploitation in food systems that disenfranchise skilled, serious artisans along the entire chain. A bold initiative to open portals of exchange between the East and the West. Met the founder Marc Oshima and had a virtual reality tour of their indoor farm and a tasting of their produce. The world’s pioneer food radio station. The studio broadcasts live from two recycled shipping containers inside Roberta’s Pizza, an innovative restaurant at the epicenter of Brooklyn’s culinary renaissance. In addition our delegates went to meet the Google Food Team NYCShedia Smalls & Michael Wurster. Experienced breakfast at the cafeteria, had a tour of the building and the micro-kitchens, restaurants, cooking class rooms and attended a presentation on the principles guiding Google’s practices on food. Another important stop was at the James Beard Foundation headquarters where the delegation had a glimpse of the foundation’s new projects, particularly a book to educate consumers about food waste. The highlight of the visit to New York , as seen in a previous post was meeting with the EU delegation at the United Nations headquarters in New York, where Sara Roversi presented the global mission and the scope of our research themes, pointing out their relevance to the SDGs.